Our exclusive to Zest, artisan cups are about halfway through production. A little while ago we announced our artisan cup project. With an appreciation for all things artisan we wanted to look deeper into some of the peripherals of coffee, some of the other artisans and makers that contribute directly, or indirectly to our coffee experiences. And where better to start than a cup maker? 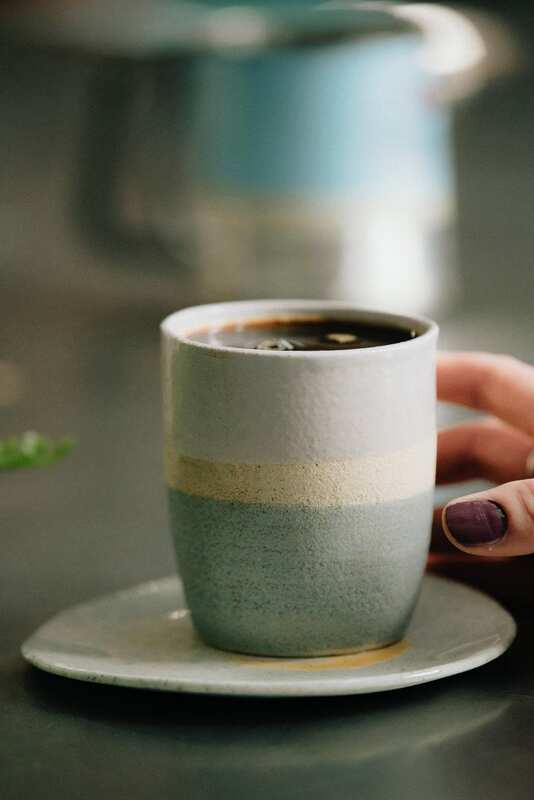 We met Eva, a local Melbourne artist, and ceramicist who was thrilled to share her passion for ceramics, and also very willing to work with Zest to produce a very special cup and guide us through the process. We gave Eva a few of our Espressist series samples and asked her if she’d create a cup inspired by the blend that spoke to her most. Eva chose African Mailman – partly because of the outstanding flavour, partly because the origins spoke to her (Ethiopia, Nicaragua) but mostly because she felt connected with the origin of its name. African Mailman took its title from an instrumental penned by the late and formidable songstress, Nina Simone. We are about halfway through the project and this week I spent some time with Eva testing glazes and poring over some of the test shapes and sizes she’s created since our last meeting a few weeks ago. Over a cup of coffee (African Mailman, of course) we discussed the challenges she's faced so far; one being winter and the time it takes for pieces to dry out in the cold. 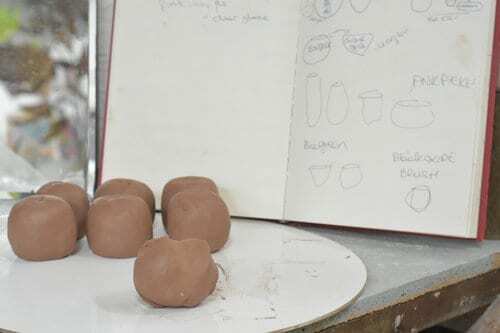 She also shared with me the next steps in the project, some of the science behind ceramics, her designing and creating process, and her passion for recycling clay. Eva starts her studio day (after coffee) by pushing off-cuts through a machine called a pug-mill. You may already guess by the name what a pug-mill does. It basically ‘mills’ clay scraps into silky brand new clay. 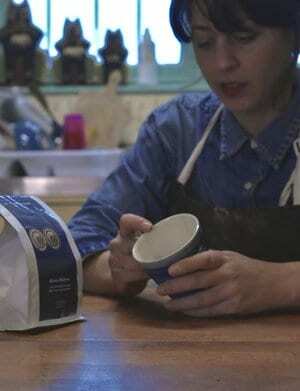 An advocate for sustainability, recycling clay has a purpose for Eva. The constant cycle of endless re-useability is part of the beauty of the material which doesn't lose any of it's quality no mater how many times it's put through this process. Pugging also becomes a kind of holistic experience. Eva explains the appeal as she pugs off-cuts through the mill with all her might, reminding me of an artisan baker kneading dough. There are benefits to recycling however. As the clay scraps wait in 'slop' buckets, re-hydrating and softening it to a workable consistency for milling, it’s not uncommon for mold to grow on the green clay. The bacteria actually gives the clay more plasticity – so the more bacteria growing on the slops through this process, the better. Eva points some out to me, excitedly. “This fermentation is really, really good for the process”. And, as lovers of specialty coffee we certainly understand this. Once the scraps have been pushed through the mill and come out the other side a softer, smoother, and more malleable product, it’s ready for a working on the wheel. Eva has been experimenting with different weights. 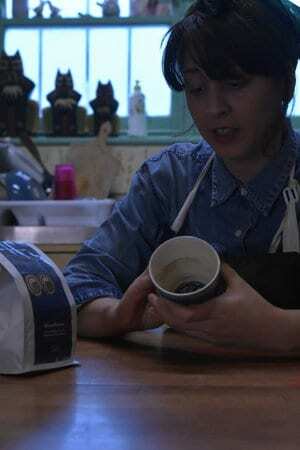 Today she’s working with 350gms per piece, which, when formed creates a (green) vessel that holds around 12oz. Taking into account the shrinkage in the drying, and again in the firing process, we’d be expecting the final vessel from the 350gm blob to hold around 10oz of liquid. Since I last saw her, Eva has experimented with 400 and 300gms also. Why the shrinkage? 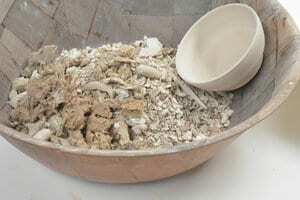 As the clay dries water molecules escape and the clay ‘sheets’ move closer together, shrinking a vessel by 5% or more. For fear of inserting too much chemistry (though us coffee people do love our chemistry), the kaolinite hydroxyls become hydrogen bonded to the next layer, forming a stronger, firmer structure. This state of the hardened clay prior to firing is called ‘green’. Watching Eva on the wheel is therapeutic. Hands working a material that's literally been in the ground for years, possibly centuries, full of minerals and nutrients, an organic matter that's about to go through several chemical reactions before being a finished piece, unrecognisable to the slops in the bucket. A silky blob of earth gets spun into a functional piece of art before my very eyes. It’s wild to think we’re using an organic product to create a cup that will hold another organic product that has also passed through (many, many) ‘artisan’ hands (coffee). And these two organic substances – coffee and clay – after being treated and worked on by many passionate humans will come together to create a very sophisticated experience for one lucky human. Wild. After discussing the findings of our last blog ‘What’s in a cup?’ Eva and I have decided on a vessel with a very slight ‘v’ shape and an ‘open’ rim, which – according to studies – should help accentuate the aroma of the coffee. We've also decided after more research the bottom of the cup will have a slightly inverted dome rather than a flat base which should keep crema intact after the pour. The inside of our cup will have a white glaze. A purely aesthetic decision. However, as was also deduced from previous findings, when drinking from a white cup the perception of the flavour can be slightly bitter – this from our emotional response to the colour of the coffee appearing darker, and therefore evoking pre-conceived ideas of a darker flavour. We’re confident the African Mailman blend has enough sweetness to counteract that perception, and, coupled with the release of the aroma from the wide, open rim the two perceptions should give us a bold, but pleasant experience. Though this is purely hypothesising. 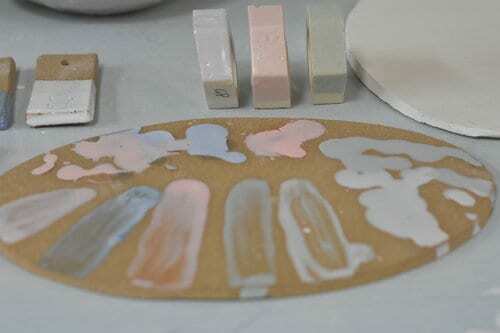 Next, we test several glazes on 2 different clay bodies. One of the bodies has been fired once at a very high temperature (1000 degrees celcius) which we call ‘bisque’, and the other is going to be glazed as a 'bone' clay (dried out without fire), which will then be given a ‘slow firing’ with the temperatures rising over time. 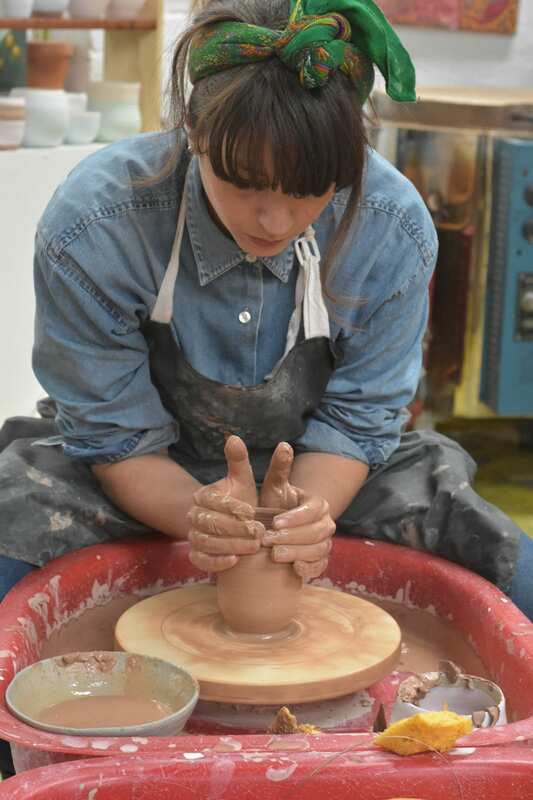 All of the slight variances can have an effect on the colour of the glaze – or slip – which changes from the original colour when applied due to chemical reactions between the different minerals in the clay. 'Glaze' is made up of glass and clay (and other minerals). 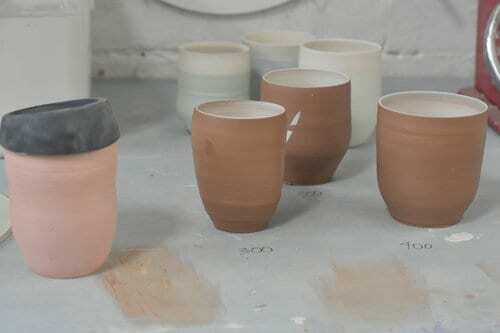 Some of the pigment actually changes colour entirely, post-firing, from the pigment in the original application. Eva shows me a green pigment, that she discovered in a "happy accident," when fired, actually produces a purple glaze due to some titanium in the mix. Hence the testing. And now we wait. Once we've seen the outcomes of the glaze tests, and the shrinkage of the final cup shapes we'll decide on a shape, size, and colour combination and leave Eva to create. This process should take a week for the tests and the final creation will probably take another 2-3 weeks on top of that, with the final production of our first run of cups ready by the end of August. If you'd like to win one of our first run of Zest Artisan Cups make sure you're following us on Instagram and Facebook over the coming weeks as a few lucky Zest followers will score on of these beauties. Also, there will be a limited run of cups for sale on the website after the project is complete.